Updates happening now!!! Fresh paint, udpated cabinets, two new full beds in guest room, and sliding door has been fixed in the master bedroom **** Come see!! This beautiful condo is just footsteps from the best sand on the gulf. 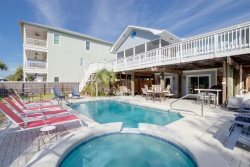 Located in the eastern most part of Destin, this is the perfect place to relax and enjoy the beautiful white sand and emerald sea. It is Unit #202 in Huntington by the Sea…Quick drive to Silver Sands outlet center, grocery stores, putt putt and lots of other great things to do. Though, close to it all, the beach at Huntington by the Sea is quiet, peaceful and family oriented. The beach in front of the property is solely dedicated to the Huntington by the Sea community, we won’t be overcrowded. The beach side pool has a large deck with lounge chairs, restrooms and grills, great for watching the colorful sunsets in the Gulf of Mexico. You can also watch the kiddos swim from your private deck. You will be mesmerized by the spectacular ocean view and easy access to the beach just a few stair steps away - no long walks or elevator rides here, although, the complex is equipped with an elevator. This beach front jewel has been completely updated with updated furniture and beautifully coordinated décor. And ladies and gentlemen you won’t be far from all the discussion if you’re in the kitchen. It is all open to the living room. The kitchen is completely stocked...full-size refrigerator, stove/oven, microwave, blender, coffee maker, and toaster to name just a few of the supplies we know you want. We have everything your family needs to feel at home. You can see the balcony area and even call out for drink orders to those sitting outside. The Master bedroom has a king bed with beach views. Curtains of course can be drawn to allow complete privacy. The second bedroom two brand new, comfortable full beds. The living room has a pull-out sofa sleeper making the condo able to sleep 8. What else will help you choose our condo over the many others? Well we provide many of the extras, others just don’t. Even Wifi, so bring your laptop!! We realize your family is coming down to the beach with limited luggage and space. We try to have many things in our condo so you don’t have to bring them with you. A “Pak-n-Play” and booster seat with tray for the baby or young child. Coin-operated laundry facility is located on-site and right across from this unit. This unit also comes with complimentary beach set up...2 chairs and 1 umbrella, March through October. However, should you wish to order an extra set or 2 prior to your arrival, you may contact Sunset Beach Service 850-244-0452. Very nice in condo and the place is wonderful. Wasnt long enough ~ but there will be next year!!!! Everyone was very nice and knew a lot about the area. White Sand is very spacious and comfortable. We were hesitant because there is not a washer and dryer, but the laundry room is directly across from this unit and it worked out perfectly. We were also pleasantly surprised when the beach wasn't crowded. Rows of rental chairs were 4-6 deep on either side of us, but we only had one row of rental chairs in front of Huntington by the Sea and since this unit provided two chairs and an umbrella, it was very convenient! We can't wait to return! The condo was perfect. It was very clean and well maintained and well stocked. The view of the beach was incredible and we were just one floor from the pool and just steps to the fabulous white sand beach.